Signed and dated l.r. corner, brown oil "JEFF SMART 45". Steve Meacham, The Sydney Morning Herald , 'Pure poetry of art's dreamers', pg. 14, Sydney, 14 Sep 2007, 14 (colour illus.). Barry Pearce, Look , 'Focus on Wastelands: How the idea was born', pg. 16, Sydney, Sep 2005, 16, 17, 19 (colour illus.). Barry Pearce, Jeffrey Smart retrospective , 'Out of Adelaide', pg. 22-33, Sydney, 1999, 27, 28. Arid Arcadia: Art of the Flinders Ranges , 'The lure of the land: an artist's destination', pg. 110-139, Adelaide, 2002, 115 (colour illus. ), 116, 118, 194 (illus.). Jeffrey Smart: drawings and studies 1942-2001 , Sydney, 2001, 27. Not quite straight: a memoir , Port Melbourne, 1996, 69-70, 106-107, 312. I blame Duchamp: my life's adventures in art , 'Jefrrey Smart: a man of great composure', pg. 179-190, Sydney, 2009, 182. 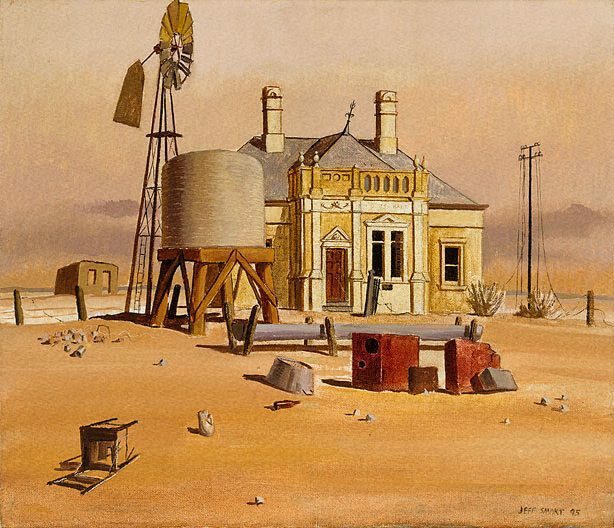 Jeffrey Smart , 'Art and life in South Australia', pg. 24-69, Sydney, 2005, 47-48, 51.